Fig. 5. Relative susceptibility of native plants from the Appalachian range of the eastern United States to inoculation with sporangia of Phytophthora ramorum. 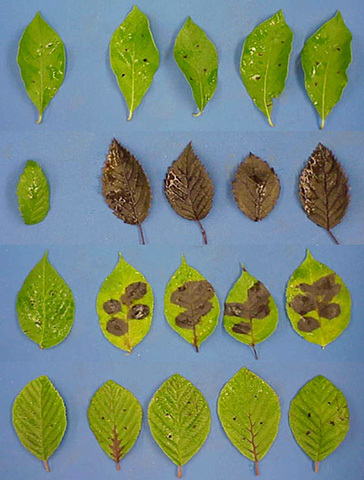 One non-inoculated control leaf is on the left in all cases. Top to bottom: Spice bush, Prairie rose, Bladdernut, and Alder.